Every poem is a song unsung. 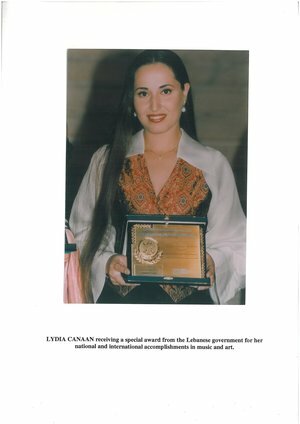 Lydia Canaan is a Lebanese singer-songwriter, poet, humanitarian, activist, and musical pioneer widely regarded as the first rock star of the Middle East. A mezzo-soprano noted by Billboard as having a "three-octave range and perfect pitch", Canaan's unique style fuses Middle-Eastern quarter notes and microtones with anglophone rock. The first internationally successful Lebanese recording artist, she is listed in the catalog of the Rock and Roll Hall of Fame and Museum's Library and Archives. The first Middle-Eastern artist to have her music videos played on MTV Europe, MTV Asia, MTV Russia, and MTV Arabia, she was dubbed by MTV Europe as "the diva from the Middle East". The problems we face as a world feed off of ignorance and isolation. Art is the indelibly effective medium by which to combat it. Perhaps it is time that we focus less on the art of diplomacy and more on artistic diplomacy. We have an aura about us which becomes stronger when you have faith in yourself. And when your aura is strong, evil dare not touch you. My dream was to give people a dream. Human evolution should be humane evolution. Art is non-divisive, all inclusive, and universally accessible. It is the primal and sacred heart of the mind, the DNA-deep instinct to express the human soul and to appreciate and delight in the expressions of others. It is the innate Divine Creative Power with which humanity is endowed. When you are deprived of something that you long for desperately, the mind finds ways of doing the same thing in different ways; it creates the potential which you never knew you had – the potential to create something out of nothing. Art is a universal language, a mighty bridge that transcends religiosity. It is embraced and appreciated not by adherents, devotees, believers, or converts of any certain sort, but by members of the religion that is Love. Lydia Canaan stands out as global citizen and diplomat artist. Lydia is a world renowned music talent, with the spirit of ambassador for the future where inclusiveness and peace are the answer to exclusion and conflict. It is incredible that amidst the state of civil war that existed in Lebanon at that time, when most people had no idea if they would see another day, she managed to keep her ambitions alive. Canaan's voice, as shown in her repertoire of song, possesses a rare resonance and a devastating effect in its evocation of love and sensuality in the refined area of the poetic dimension. As a girl who grew up in the midst of a bloody civil war, Canaan was breaking down seemingly insurmountable barriers: she rocked the establishment. In a small country that was ripped by war, there was this young girl making a difference. Recognized as the first rock star of the Middle East, she was born into a diverse Lebanon that has stood out as a jewel in a war zone. Lydia shares with many of us the vision of what is possible in our best aspirations, and how we can all be partners in this future. For Lydia Canaan's first gig, she had to throw her trademark short rockish black leather skirt and studs out of her bedroom window in Brummana, put on a long skirt, lie to her conservative father about where she was going, and, after changing into her leather gear, singing her teenage heart out as Angel with the band Equation. MTV is proud and privileged to play Lydia's videos on Music-Non-Stop Show...All at MTV have fallen in love with Lydia, her songs, and her performance. ↑ a b Salhani, Justin. "Lydia Canaan: The Mideast’s First Rock Star", The Daily Star, Beirut, November 17, 2014. ↑ a b O'Connor, Tom. "Lydia Canaan One Step Closer to Rock n' Roll Hall of Fame", The Daily Star, April 27, 2016. ↑ Livingstone, David. "A Beautiful Life; Or, How a Local Girl Ended Up With a Recording Contract in the UK and Who Has Ambitions in the U.S.", Campus, No. 8, p. 2, Beirut, February 1997. ↑ Ajouz, Wafik. "From Broumana to the Top Ten: Lydia Canaan, Lebanon's 'Angel' on the Road to Stardom", Cedar Wings, No. 28, p. 2, Beirut, July–August 1995. ↑ Aschkar, Youmna. "New Hit For Lydia Canaan", Eco News, No. 77, p. 2, Beirut, January 20, 1997. ↑ a b Sinclair, David. "Global Music Pulse", Billboard, New York, December 27, 1997. ↑ a b Sinclair, David. "Global Music Pulse", Billboard, New York, May 10, 1997. ↑ Hayek, George. "The Lebanese Singer Lydia Canaan Has Invaded the European Market With Her Ballads", Al-Hayat, No. 12,513, Beirut, June 3, 1997. ↑ Khalife, Mireille. "Lydia Canaan Tells Her Story...and Launches Her English Songs Internationally from Lebanon", Al-Hayat, No. 13,732, Beirut, October 16, 2000. ↑ Khonji, Tariq. "Lebanese Singer to Entertain Golf Fans", Gulf Daily News, No. 217, Bahrain, October 23, 2001. ↑ "The MTV Spirit in the Air of Beirut", Magazine, Beirut, May 19, 1995. This page was last edited on 1 April 2017, at 21:30.